Eisenbart & Sons has been a local family-owned and -operated business in Orange County since 1982. With a project history that includes more than 100,000 jobs, we have the experience and dedication necessary to handle any window, door, or glass installation. Whether you're looking to add a touch of elegance to your home, or you need an entire renovation, Eisenbart & Sons is Southern California's best choice for doors, windows, and more. Our friendly, expert staff has extensive experience installing doors, windows, glass, mirrors, and screens, and they can answer any related questions you may have. We take pride in our quality workmanship; we'll help you improve the look, feel, and value of your home with absolutely no damage to your existing structures, all for the best value in town. We can do this because our doors, windows, and other products are custom made to fit the structures in your home or business. We carry most major brands, including Milgard, Ply Gem Windows, La Cantina Doors, Agalite, Custom Industries, AAW Doors Inc, BGW Doors, T.M. Cobb, and C.R. Laurence. 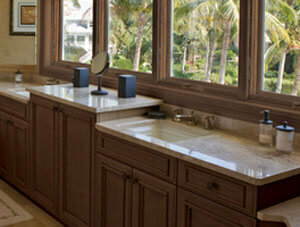 For the highest quality window, door, and glass products and installation services at the best value, call us today. We accept Visa, MasterCard, and Discover.